I missed last week's CASEing Genius because I was flying home from CHA and there just wasn't enough time to get it together before I left. I packed the morning I left for God's sake. Time manager of the year I am not. Anita has such a fun style. Most of her cards tend to be clean and simple or clean and layered but what I love about her is the variety. Sometimes she's watercoloring, other times, die cutting, throw in a bit of ink blending. . .I just love that she's not afraid to spread her wings. Often crafters (myself included) allow ourselves to pigeon hole our style and we never break out. Anita breaks out with every card and I adore that. You can see the veritable cornucopia of gorgeousness on her blog, My Papercraft world. 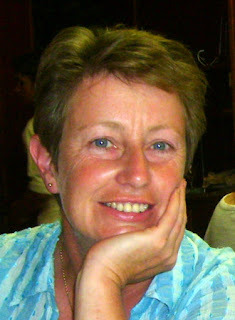 Bonjour … I’m Anita, blessed to live in beautiful south west France … hence I’m known in blogland as ‘Anita in France’. Mostly clean and simple … sometimes graphic, sometimes quirky, occasionally whimsical … and at times, I’ll throw a technique or two into the mix. Wink of Stella … a crush that’s gone on for the last goodness knows how long! I just got a set of Zig Clean Colour Markers and have a sneaking suspicion they’re going to be vying for the crush spot! I’ve almost always crafted in one way or another (a bit like walking!) and one of my first pocket money purchases was felt to clothe nativity figures I’d made for a crèche. When I got into card making seriously, about three years ago, my first purchase was a black ink pad and a couple of Penny Black floral stamps. Yes, I’d buy both again … don’t have the felt any more, but do have the PB stamps. I love old movies and would be very happy to go back in time and play anyone opposite Cary Grant or Gregory Peck in their dishiest days! I’m qualified as an Advanced Open Water Diver … those wet suits make such a fashion statement! Loves Wink of Stella and Van Morrison. Oh yeah, we can be friends. I just love this card. It makes my little heart go pitter patter. Bold florals with a pop of black and white heat embossing. Swoon. Those bright ballons are the star of this show but I adore how Anita balances the card with a strip of gray down the side and a large black sentiment. Who said neutrals were over rated? That shadow! You know I love a good shadow and the die cut shadow is gorgeous. I love how she created her own pattern paper by stamping multiple flowers. So beautiful! As you can see I was heavily influenced by Anita's first card. Please, it had everything I love. I did try the "Black Magic" technique for the first time and while it was time consuming the results were very bright. You can see it all in the video below! Anita is fabulous! I can see why you would case her! TFS Kelly!! Love Anita's style! Love your CASE of her. Kelly you've chosen one of my faves today! 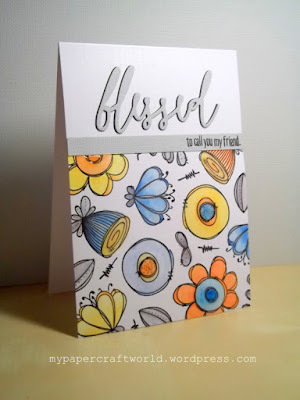 Anita is the most darling blogging friend, love her to pieces, LOve her cards - yes EVERY one - one of those featured is on the top ten list - and her comments are generous, heart-felt and most sincere! Congratulations, mon amie! Gorgeous CASE, Kelly! Anita is one of my favorite artists, and I'm so happy you have featured her today! Thanks so much for another amazing video, too! Oh, I love Anita's work! She is so talented and sweet. Your case is fabulous! 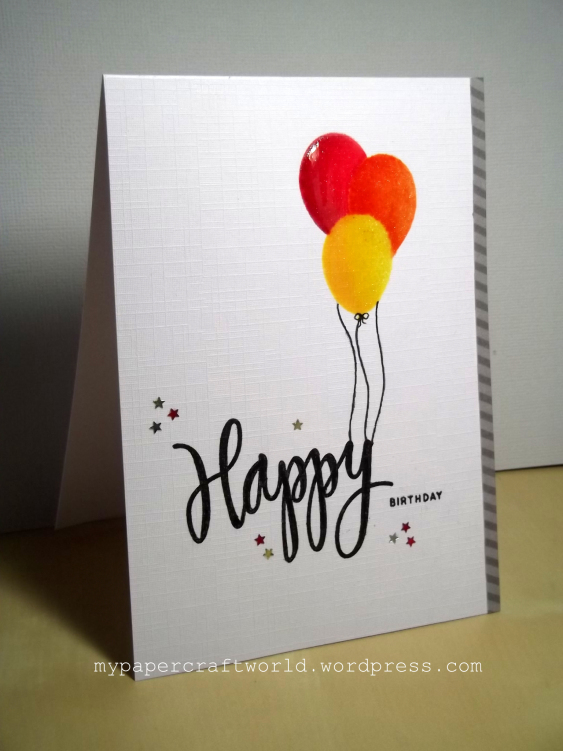 Anita's cards are always beautiful! Love your CASE, Kelly. Congrats, Anita. Yeahh to Anita - I wish I could meet her in person...Always love her work. How wonderful to see her showcased here! Wonderful CASE of Anita's card! Thank you, Kelly, for showcasing one of the belles of blogland! Anita has been one of my most ardent supporters and I'd give anything to meet her in real life. Her creativity is boundless; her friendship, priceless! Thrilled to learn more about her (the open water diving certification is new to me) and to see 'second helpings' of this fabulous trio of cards. You've captured Anita's genius marvelously in your 'fused' case of her styles! I love Anita and her work, terrific artist to CASE! Kelly, your card is a perfect representation of Anita's style. Amazing card and I love that technique. Wonderful cards, I'll have to pop over to her blog. Thanks for introducing someone new and so talented. Your CASE is fabulous, looking forward to the video for this technique. Wonderful card Kelly...just love your take on what Anita has created. You are so amazing and talented. Having had the honor to meet and sit across from Anita for an enitre week watching her create her little masterpieces, you really nailed her incredible style. What a gem you chose today!! Love Anita's interview and her fabulous cards. Your CASE...well, it's genius!! PS-I'm more of a lurker than a commenter. Sorry! 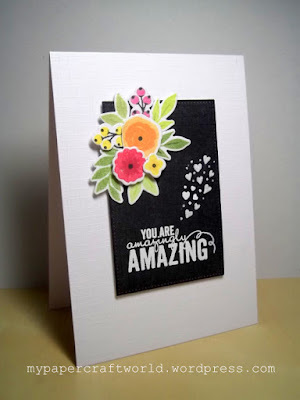 I am so impressed at how you combined Anita's cards and talent...you are a genius too! Brilliant of you to choose Anita as your Genius...cuz I think she is. Anyway, your card looks amazing although it sounds like it drove you nuts. Great Caseing today, I enjoy Anita's work. Thanks for sharing the black magic technique, your card is beautiful. Hip hip hooray for Anita's recognition who is a lovely and generous artist. I love how you cased her work with the black cardstock. First, I LOVE Anita in France and so glad that you CASE(D) her!! Second, that card is giving me heart palpitations it is so BEAUTIFUL!! That technique is just oh so cool!!! Thank you for sharing!! What amazing cards by Anita!! love your case too, with the use of the black and whit embossing. I enjoy the black magic technique - it's a good one to have on hand for colouring when bored with TV! Thanks for sharing about Anita and her great looking cards! Kelly your take on hers looks nice too! These are incredible Anita! Love the coloring on black Kelly! Anita is a favorite of mine, I just love her style! Your card is really dramatic and , Kelly, I love it! So glad you featured Anita! She is one of the sweetest people in blog land and I absolutely love her style! You CASEd her beautifully! Btw, this Genius feature is awesome! wow... kelly! thanks for inspiring me! super georgeous card and the tech 2! Kelly your CASE of Anita is so fabulous--I know you don't use you coloured pencils very much but wow the results are so gorgeous. Loved seeing the case of Anita, she is such a sweetheart and so super talented! Kelly, your CASE is beautiful! I absolutely love Anita...such a joy to see her here. Like Darnell, I'm also a bit late to the party (which is the norm for me!). You chose one of the sweetest, kindest, caring, smart, talented person that I know to CASE! And yes, you would absolutely love her to bits in real too! Your case'd cards are amazing! You have totally captured her style and design in your creations! Fabulous post! Great answers! Had no idea Anita was a certified diver!!! Loved to read Anita's interview and see her inspiring cards here! And your CASE of Anita is just gorgeous! Thanks for the video! Wonderful interview and cards, and I am so delighted to see you CASE Anita, as she truly is a creative genius and a constant source of inspiration to me. A beautiful CASE of a dear friend!